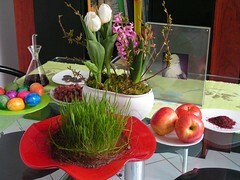 Today is the beginning of spring and the Persian new year, the ancient feast of "Naw-Ruz". Naw-Ruz is celebrated by Iranians and related cultures, but also by Bahá'is all over the world. This is our "Haft cin". It is a tradition to put up 7 things that start with a "c" (in Persian, like hyacinths, vinegar, coins and apples among others) for good fortune as well as other symbolic things (eggs, fish, mirror).